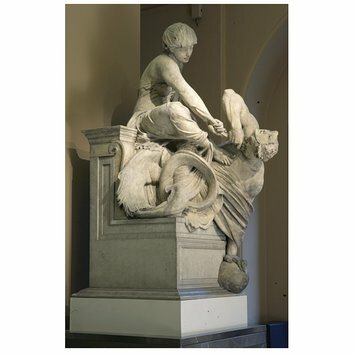 After a long selection process, the little-known sculptor Alfred Stevens was awarded the commission to produce a monument to the Duke of Wellington. He had already produced a reduced version of his intended monument as his competition model in 1857. This model is also in the Museum's collections (Museum no. 44-1878). 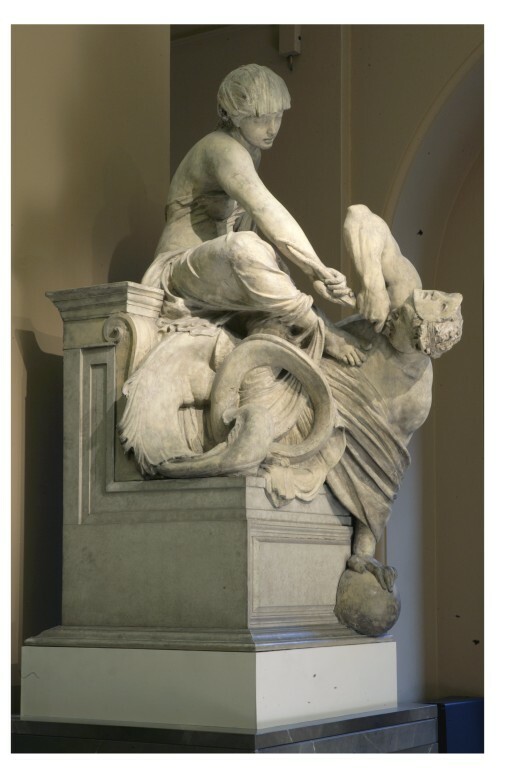 This group and its companion depicting Valour and Cowardice (Museum no. 321B-1878) are full-size models for the bronze groups featured on the Wellington monument in St Paul's Cathedral. They were not completed by Stevens until 1866. In this work Truth tears out the double tongue of Falsehood and pushes aside the mask concealing his grotesque features. His serpent-tails are exposed beneath the drapery. The entire monument comprised a triumphal arch with the bier and recumbent effigy of Wellington. The colossal figures of Truth and Falsehood and Valour and Cowardice were placed at either side. The monument was not completed until 1912, almost 40 years after the death of the sculptor. Model. Portion of the design for the monument to F.M. the Duke of Wellington. 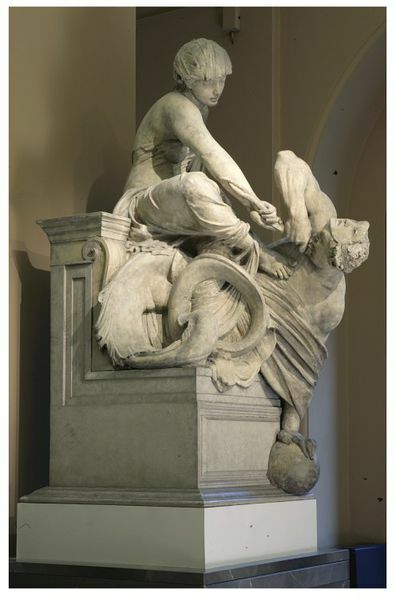 This is a full-size model for the bronze group of Truth and Falsehood on the Wellington monument, The group depicts Truth pulling out the tongue of Falsehood and pushes aside the mask concealing his grotesque features. His serpent-tails are exposed beneath the drapery. Purchased from Alfred Pegler, Esq., Maybush Lodge, Old Shirley, Southampton, together with cat. nos. 577 and 581 in 1878 for £150.